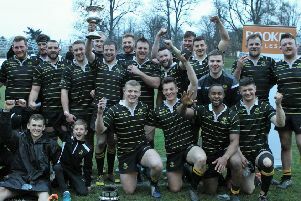 Melrose are Scottish club rugby champs after beating Currie 26-10 at the Greenyards and Gala were narrowly beaten 34-33 by Ayr at Netherdale. Coach John Dalziel and his team have an anxious wait to hear if his team has won the title. Melrose have got obvious question marks heading into the 2015/16 BT Premiership but in the Border League are still one of the surest bets to take home the title in 2015. Last season will go down as one that got away for the Greenyards side. Melrose’s air of invincibility was ruthlessly exposed in the most agonizing of ways by Heriots in the Premiership play-off final, crushing their title hopes in the final 30 seconds, while finishing fourth in the Border League behind Selkirk, Gala and eventual winners Hawick, the only Borders team to beat them all season. With the faded memories of that disastrous end, Melrose head coach John Dalziel admits his side are completely re energized and eager to get their competitive season underway against Jed-Forest at the Greenyards on Friday night. “The way last season ended it was heartbreaking, soul destroying really,” he said. “But that’s in the past now and the boys have been hard at it to make up for it this year. For Jed-Forest, one draw and six losses last season don’t expel much confidence that an upset is on the cards but director of rugby, Ali Campbell, remains confident his side can raise some eyebrows. “The boys are relishing the challenge and maybe we might catch Melrose cold,” he commented. On Saturday, Kelso and Gala get set to lock horns in a Borders League battle at Poynder Park with both clubs eyeing an improvement on last year. The away side head into the game as surefire favourite but with so many omnipresent absurdities defining the Border League anything can happen.